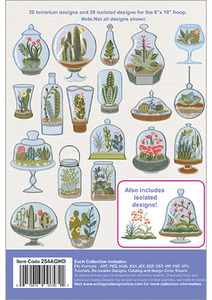 Terrariums / Full Collection /20 designs and 20 isolated designs for the 6”X 10” Hoop. When we designed this collection we were looking for reasons to use clear vinyl in a new project. We had just completed the invisible bag collection and wanted to use it again in something new. The idea of miniature terrariums took shape, and that’s all the inspiration our artists needed to complete this beautiful collection of designs. There are 20 different miniature gardens in this collection and each one of them is finished with a piece of clear vinyl to simulate a piece of glass. The designs were digitized using very specific techniques so that the vinyl would not perforate resulting in a very unique embroidery design. 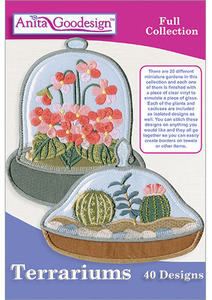 Each of the plants and cactuses are included as isolated designs as well. You can stitch these designs on anything you would like and they all go together so you can easily create borders on towels or other items.